Mayor Michael Mignogna, Fire Battalion Chief Jim Poland, Eastern Regional High School student Veronica Alday and the Voorhees Business Association were honored by the Voorhees Breakfast Rotary Club. Honorees at the Voorhees Community Service Aware Ceremony. From left: Lisa Goldwasser, John Rowland, Mayor Michael Mignogna, John Poland and Veronica Alday. 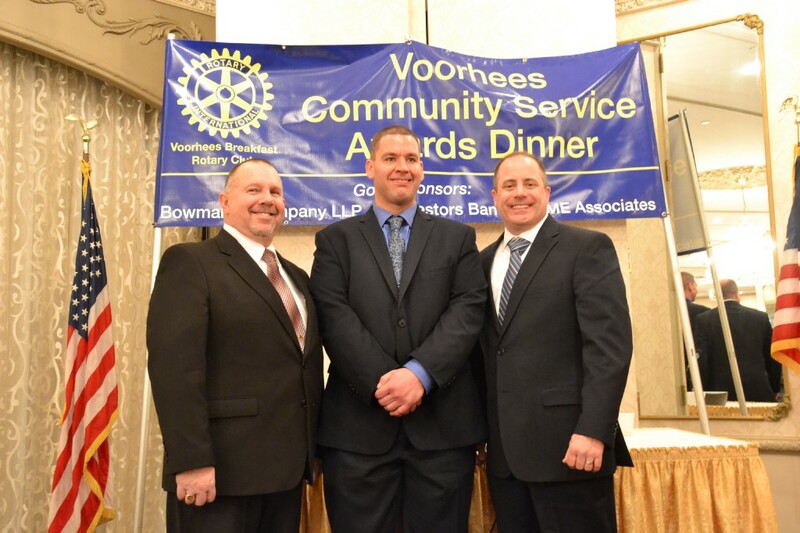 Local residents and a business association were honored at the 2016 Voorhees Community Service Awards Ceremony hosted by the Voorhees Breakfast Rotary Club Thursday night. Inspired by their motto, “Service before Self,” the Rotary Club has been recognizing others in the community who live by the same credo for the past eight years. 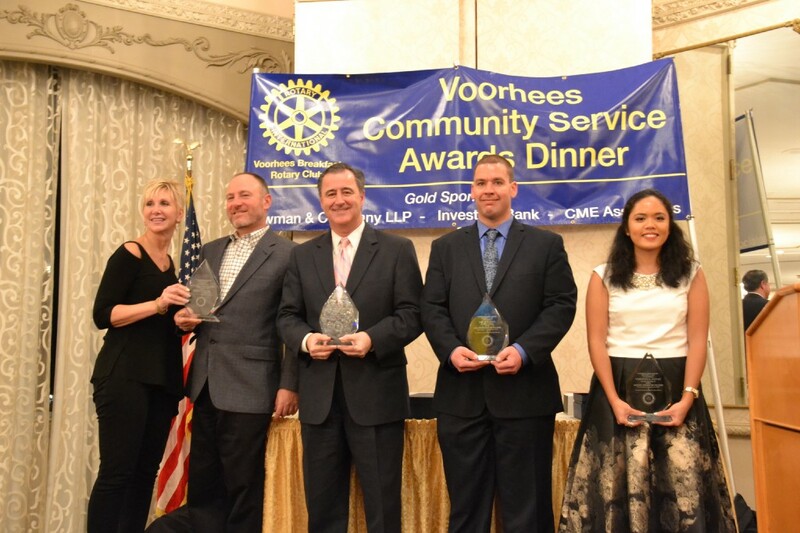 Mayor Michael Mignogna was chosen as Voorhees Citizen of the Year, Fire Battalion Chief Jim Poland was chosen as First Responder of the Year, Eastern Regional High School student Veronica Alday was chosen as Student of the Year, and the Voorhees Business Association was chosen as Voorhees Business of the Year. Mignogna started off by humbling saying he’s usually on the other end of the spectrum, giving these awards instead of receiving them, and this award is particularly special to him. 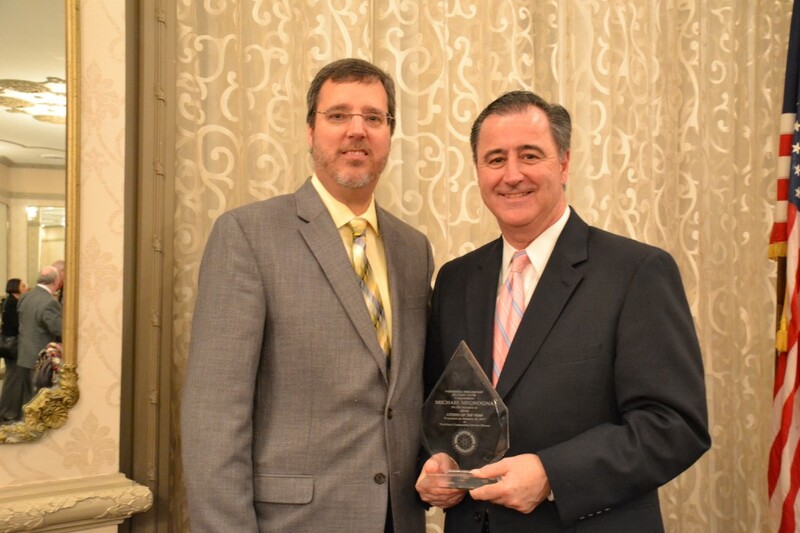 Kurt Stroemel with Mignogna after he was honored as Voorhees Citizen of the Year. Stroemel introduced Mignogna to attendees before he received his award. He thanked his family, especially his parents, for instilling the importance of community service in him at a young age. Alday, a senior at Eastern, regularly contributes to the community by volunteering at the Voorhees Pediatric Facility and being an active member of the Interact Club. She recalled a few events Interact Club has hosted over the years where residents were touched by her and her classmates’ kindness, including a senior citizen who thanked them for taking time out of their Saturday morning to host a brunch that was so meaningful to her. Alday also recalled a little girl at Breakfast with Santa who had the biggest smile on her face, and she’ll never forget the feeling of appreciation and happiness she had that day. Poland is a third-generation firefighter in Voorhees and fourth member of his family to serve in the fire and emergency services. From left: John Stahl, Poland and Mark Lafferty. “It’s truly an honor for me to be here receiving this award,” Poland said. “I’m humbled; I don’t think I deserve this. There’s dozens of other firefighters, EMTs and police officers who proudly deserve this award over me, but I’m very thankful and honored. The Voorhees Business Association is a community-based partnership of business, civic and educational segments of Voorhees whose mission is to provide a forum for business people to meet, share and discuss concerns and interests of a civic commercial, cultural or economic nature. Mark Schott, chairperson of the event, praised the association for its philanthropic contributions and making the community a better place. “They raise funds for two Eastern Regional High School scholarships for graduating seniors, they sponsor the Strike Out Kids Cancer Community Fair, and they contribute to the Voorhees Police Holiday Fund, collecting money for families who would not have a Christmas if it wasn’t for these donations,” Schott said as he introduced the organization. John Rowand, one of the members who accepted the award, said the association is a great core of people who do business together and enjoy raising money to help others in their community. “You’re not just getting work from these people, which is very beneficial to businesses because you get jobs from it, but at the same time, you’re giving back, and when you see these things happening, it’s a really good feeling,” he said. The Voorhees Breakfast Rotary would like to thank its sponsors for this event. Gold Sponsors were: Bowman & Company, LLP, CME Associates, Investors Bank. Silver Sponsors were: Columbia Bank, Samaritan Healthcare & Hospice Virtua; Wade, Long, Wood & Long, LLC. Bronze Sponsors were: CNNH, Leonard O’Neill Insurance Group, Lion’s Fate, Neuner & Ventura, LLP, Tutoring Club and The Val Nunnenkamp Team — Berkshire Hathaway.